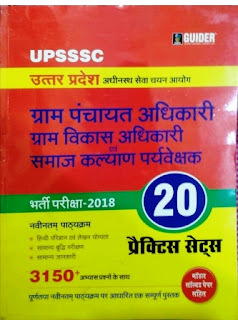 UPSSSC VDO Practice set Download: Uttar Pradesh Subordinate Services Selection Commission (UPSSSC) Lucknow Gram Panchayat (Adhikari )Officer, Village Development Officer and Social Welfare Supervisor (General Selection) Competitive Examination 2018. This book is just a solved model test paper for upsssc vdo exam. It contains 20 practice set. In the Third Part Part, we are presenting 5 set only. Now it is from 11 to 15. How can I download part 3 of VDO practice set, Sir? There is no link to show any download option. UP Gram Vikas Adhikari Admit Card 2018: Uttar Pradesh Subordinate Service Selection Commission will release UP VDO admit card. While downloading UPSSSC Gram Vikas / Panchayat Adhikari admit card use correct details only.